We can improve the performance of your workforce and make your organization operate more effectively. 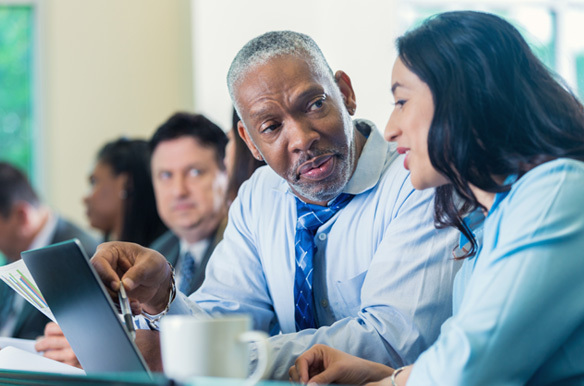 Our Corporate Training Services offer courses that provide insight, skills, and tools for individual and organizational improvement. These programs are designed to fit the dynamics and needs of your changing workplace. Interested in purchasing Corporate Training Services for your organization? Contact us today! Our Corporate Training faculty is comprised of employee training and development experts well versed in delivering programs that effectively increase both employee productivity and employee retention. Our faculty represents a variety of business backgrounds including manufacturing, high-tech industries, healthcare and other educational disciplines. Our faculty can develop and customize a training on virtually any topic, such as: Balancing Work & Family Life, Time & Stress Management, Conflict Resolution, Improving Communication, Drug and Alcohol Awareness Training, Diversity in the Workplace, Sexual Harassment Prevention, Transitions, Workplace Violence Prevention, Leading the Team. Or call 1.800.364.4748 to purchase Corporate Training Services for your organization. Want to sign up for Corporate Training Services?